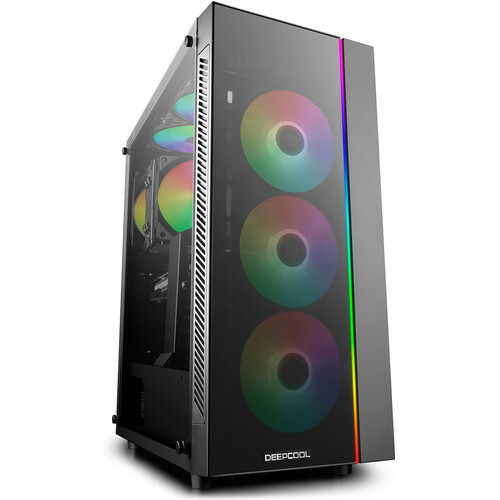 Light up your PC build while keeping your components clean and cool with the MATREXX 55 ADD-RGB 3F Mid-Tower ATX Case from Deepcool. Equipped with front and side tempered-glass panels, the MATREXX 55 ADD-RGB 3F features a front addressable RGB light strip and three pre-installed addressable RGB fans for showing off your build, while a pair of front air intakes help to optimize airflow. Designed for E-ATX, ATX, Micro-ATX, and Mini-ITX motherboards, the case comes with two 3.5" and two 2.5" drive bays, along with room for front, top, and rear radiators. A magnet-mounted dust filter in top is designed for easy removal and cleaning. An addressable RGB lighting strip in the front and three pre-installed addressable RGB fans provide five lighting effects (dynamic color, static, breathing, comet, and fashion collision) and can be controlled by a button or via the motherboard. Two extra connectors allow for motherboard sync control with other Deepcool/Gamerstorm 5V addressable RGB devices and third-party 5V 3-pin RGB devices. Full-sized 4mm-thick tempered-glass side and front panels are ideal for showing off your PC's internal structure. The case is designed for optimal airflow, with air intakes on two sides of the front panel and air exhaust vents in back and on top. The case offers 23mm of clearance and a cable-hiding PSU shroud to help optimize cable management. The magnet-mounted dust filter at the top of the case is designed for easy removal and cleaning. Internal Drive Bays 2 x 2.5"